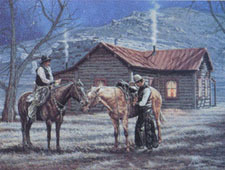 The oldest brothel in the Big Horn Basin was constructed about 1885 by Rose Williams, formerly of Red Lodge, Montana. Through the doors of this establishment walked some of the most infamous characters of this region, including Butch Cassidy, Jack Bliss, W.A. Gallager, Blind Bill Hollihan, Bill Wheaton, Black Jack Miller, Belle Drewry, Sage Brush Nancy Swaim and many others. With the rerouting of the Red Lodge trail, the rowdy little town of Arland and Rosie's place found themselves being visited less and less, until finally they were abandoned, to become part of the rich history of Northwest Wyoming. Exclusive issue of only 500 signed and numbered artist's prints at $175.00 each. Image size - 19" X 26".